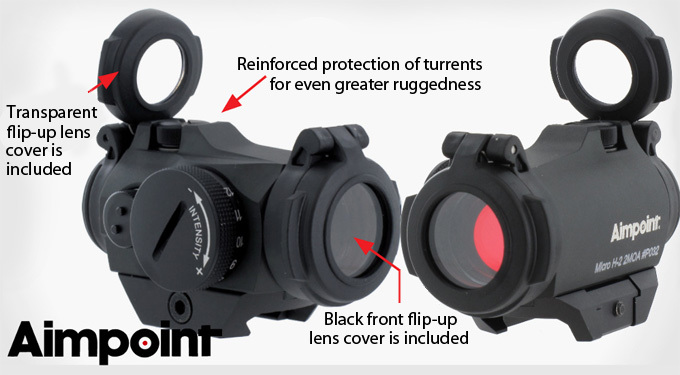 Aimpoint is a name that always stands at the forefront of innovation when it comes to reflex sights - otherwise known as pointing sights or red-dot sights. The new Micro H-2 is perfect for hunters. Whether you're chasing gobblers with a scatter-gun, hogs with a handgun, or even big game with an AR or bolt gun, this 3-ounce micro sight with its 2-MOA red dot will handle the job with ease. Enhanced lens coatings, front and rear protective flip covers, gated adjustment caps, and a constant-on battery life of five years (50,000 hours) makes this an excellent choice if fast-action precision and performance are sought. The new 13-ounce, 5.5-inch-long 518 isn't the smallest reflex sight of the bunch, but. that's because you feed it two AAs — the most common batteries in the world. Good luck finding CRs when you're hunting in a town where the grocery store and cafe are in the same building as the game check station and saloon. 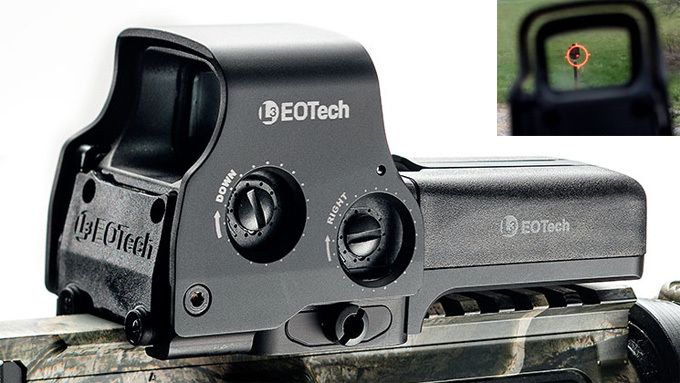 And don't forget, EOTech sights are holographic, not traditional red-dot, so they don't increase in size with a magnifier. The 518 has an ultra-accurate 1-MOA aiming dot with 20 brightness levels for picky eyes. If you're into killing hogs and predators after dark, the 558 model is identical to the 518, but it's compatible with night-vision optics for $90 extra. This tiny sight from Vortex has the smallest price tag in the lineup, but its rich with versatility. It can be mounted on any rifle or shotgun with a Picatinny rail, but what really makes the Viper hiss is its extremely low mounting height (1.02 inches) — a perfect fit for handguns with cutout slides. The 6-MOA red dot with 1-MOA adjustability essentially rules it out for precise shots on faraway animals, but its a killer option for popping pigs or pounding predators that you call into your lap. It uses a CR2032 battery that reportedly lasts 20,000 hours at its lowest setting. 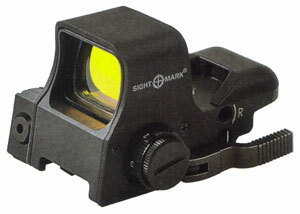 With these features and at such a low prices, this rifle pointing scope sight is a steal. If this micro from Meopta were any smaller, it would be a figment of your imagination. It'sjust 1.29 ounces, and its longest dimension measures less than two inches, making it the smallest reflex sight of the roundup. The MeoSight comes with an integrated quick-release mount that works wonderfully with ARs, shotguns, and handguns. Slap it on the side rail of your AR as an ideal secondary optic for close-quarters shooting. Choose from a 3 or 5-MOA dot, each with a 60-MOA range of windage and elevation adjustments to suit your shooting needs. The Meopta Meosight 3 runs for up to 1,000 hours on two CR2032s and automatically turns off after three hours of inactivity. The MRS weighs just 2.5 ounces, but don't underestimate this little feller —it's a bite-sized force to reckon with. Lightweight, compact and unobtrusive - the Steiner Micro Reflex sight uses special coated glass for excellent rapid target acquisition. The holographic 3-MOA red dot sight reticle can be set for auto-illumination or three manual brightness levels, with 1-MOA click adjustments for windage and elevation (30 clicks max.). It's ideal for a home-defense weapon - smg, pistol, shotgun or rifle...but if you leave it on the nightstand, don't be surprised if it begs you to go hunting. The USA-made D-EVO (Dual-Enhanced View Optic) is unlike any AR optic you've ever seen. It's a 6x20 fixed-power optic that's made to pair up with virtually any red-dot sight on the AR15 rail. 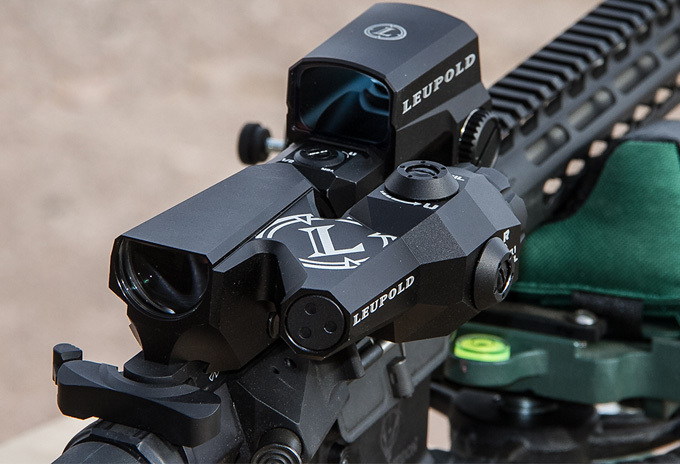 The Leupold DEVO allows the best of both worlds for all combat situations. Imaging being on patrol in Afghanistan and encountering a medium distance threat. You are engaged in a contact with the enemy, you use your Leupold D-EVO fixed power optic to engage the enemy with sniper like accuracy. Suddenly, a threat appears close range forcing you to swing around and use you fast aquasition red dot site to quickly target the enemy without having to think twice! Why? because you had fitted a multi-distance engagemnt solution fitted to your weapon, the Leupold D-EVO system. The D-EVO easily mounts on an AR's rail behind your primary 1x optic, but it sits low enough so you can use both sights at once by simply moving your eye - no need to move your head or adjust your cheek weld. Keeping the exact same sighting and firing stance, your position is secure. The excellent matched eye relief allows simple selection of optic device without having to worry about re-focusing. Leupold's CMR-W reticle features a .5-MOA dot surrounded by a 5-MOA circle, with mil-based windage points and holdover marks matched to 5.56 NATO/.223 Rem. and 7.62 NATO/.308 Win. cartridges. The perfect match for military chambered rifles. Forget about farcical futuristic digital rifle sighting systems being "tested" for the military, the is a right-here right-now "latest technology" weapons optics system - solution. Being of solid construction, low profile and light weight, this is the future of rifle sights for todays combat conditions. Predators and enemies might want to stay underground as the game gets easier for the hunters, and harder for the hunted. The Ultra Dual Shot Pro Spec features a quick detach mount for rapid removal, allowing shooters to effectively adapt their firearm to the situation at hand. Featuring an improved lens system, the Sightmark Ultra Dual Shot red-dot sight retains accuracy when fired from the periphery of the lens. The Interlok internal locking systems hold zero so the shooter does not have to continually readjust the sight. The all-aluminum construction enhances durability, making it operable in various environments. Featuring a side-mounted laser for quick target acquisition, the shooter can fire from the hip in close quarter situations. Equipped with a night vision mode, the user can mount the it in front of a night vision monocular to create a co-witnessed riflescope setup. Outfitted with four reticle patterns, the Ultra Shot Pro Spec provide s precision accuracy day or night.